A version of this story appears in the December 2017 issue ofNational Geographic magazine. GOMA, Democratic Republic of the Congo-Trackers swing their machetes at the thick jungle, and veterinarians Eddy Kambale and Martin Kabuyaya follow behind, armed with cameras and clipboards. The tangled vines hide the forest’s many dangers: poachers, rebels, and herds of wild elephants. In 1985 Dian Fossey hired veterinarian James Foster to join her research station in Rwanda as the first “gorilla doctor.” A few weeks later Fossey was murdered-a crime that is still unsolved-but Foster came anyway, opened his clinic, and carried on the American primatologist’s legacy. The critically endangered species has made a remarkable comeback, thanks in large part to Fossey’s work, but deforestation, poaching, and war continue to threaten their existence. In 2013, a rebel group called M23 seized the lodge and gorilla habitat in Virunga, Africa’s oldest national park. Insurgents surrounded the Senkwekwe Center, preventing the Gorilla Doctors from accessing it. In the chaos, Kaboko, a one-armed gorilla, became sick with diarrhea overnight. With the roads to Virunga’s headquarters blocked, he died early the next morning. 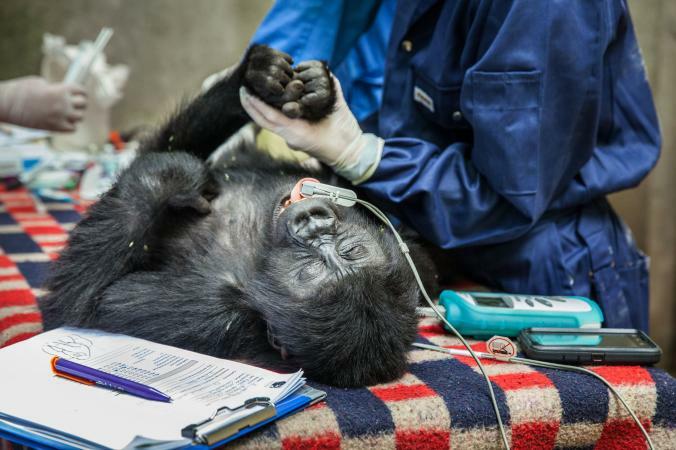 Ndakasi, a 10-year-old gorilla, is sedated in order to get her vital statistics. 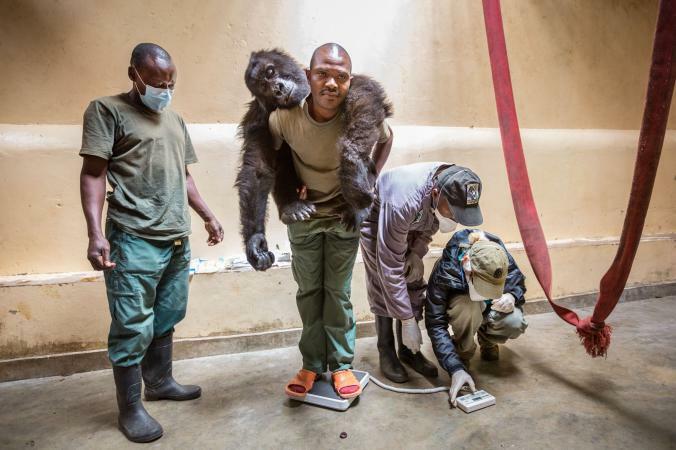 Patrick Karabaranga, one of the caretakers who live at the sanctuary in Virunga National Park, holds her on the scale. They would drive out of Goma, past United Nations bases and Congolese Army stations, to the park border. Then they’d show their identification and the rebels would wave them through. The vets collaborate with the Dian Fossey Gorilla Fund, a U.S.-based gorilla research organization, to collect information about each gorilla’s behavior before intervening. 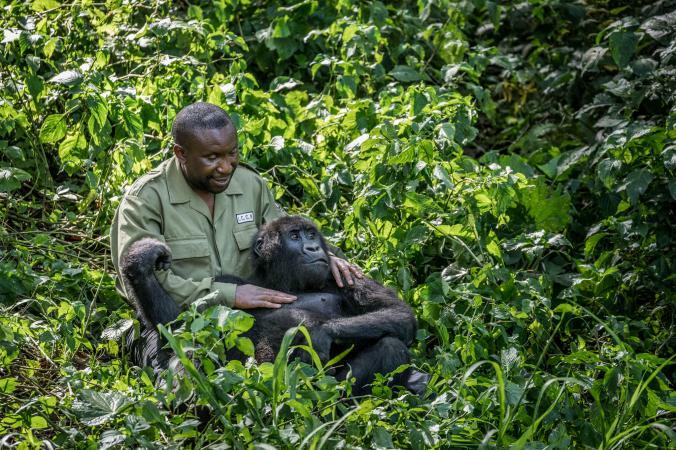 This is critical for their safety-as Kambale learned after being charged by a protective silverback while trying to remove a snare from a baby gorilla. 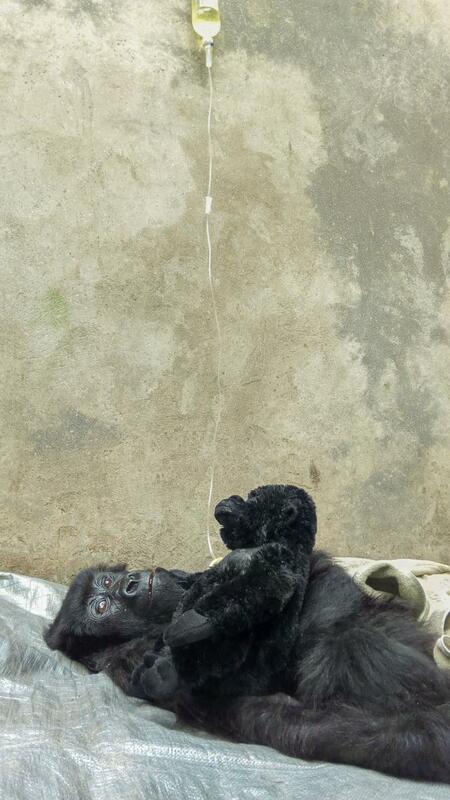 The veterinarians have worked through some of Virunga’s darkest moments. In 2007 poachers-possibly led by a corrupt then-warden-massacred seven gorillas. With nowhere to keep the young survivors, the park moved them into Gorilla Doctors’ offices in Goma and then to the new Senwekwe Center (named for the murdered silverback of the group). They were later joined by Maisha and Kaboko, both of whom were taken from poachers. 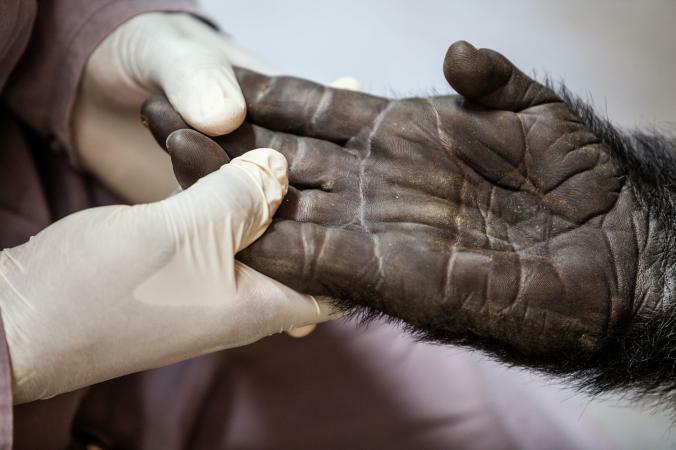 The Gorilla Doctors document the health of the region’s primates in monthly checkups. Ishema, an adult female, relaxes in Volcanoes National Park in Rwanda. Despite a quarter century of regional conflict, the mountain gorilla population is bouncing back from the brink of extinction-where it was when Fossey began her work. Greer attributes this to tourism, government intervention, and the veterinarians’ work. But, he notes, with fewer than a thousand members of the species left, “we do not have the luxury to let our guard down.” One threat in particular frightens Greer: “A newly introduced virus into the population has the potential to inflict catastrophic harm,” he says. When gorillas are rescued from poachers, they’re examined by the Gorilla Doctors. Kalonge’s exam included a DNA test, which determined that she was actually a Grauer’s gorilla, a subspecies of the eastern gorilla. She was moved to a sanctuary in the Democratic Republic of the Congo to join other Grauer’s gorillas. But if the virus appears in the eastern province where the Gorilla Doctors work, they’ll be among the first dispatched to track its source-and help contain the disease before it reaches the remaining mountain gorillas and the humans who live near them. André Bauma, the manager of the Senkwekwe Center, plays with Ndakasi. The young gorilla was found as an infant clinging to her mother, who had been killed by poachers. Bauma nursed her back to health, and she became one of the sanctuary’s first residents. The caretakers at Senkwekwe have become surrogate parents to the three orphaned gorillas living there. In Swahili, her name means “life,” but recently her listless behavior had the veterinarians worried. She’d been losing weight since her companion, the one-armed Kaboko, died during a rebel attack on their shared sanctuary a few years earlier. Nothing showed up on an x-ray or an ultrasound, so the doctors sent the samples to a lab that seems unfathomably far from the rain forests of central Africa: Disney World’s Animal Kingdom. When their lab didn’t find anything suspect in her samples, the stumped vets tried to help her as much as possible before she passed away in July. 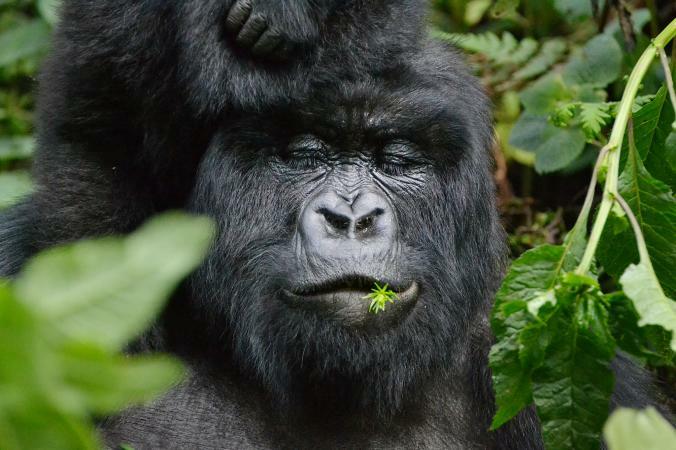 Even so, these gorillas are the lucky ones in the DRC’s animal kingdom.None of the country’s nine other national parks have a dedicated veterinary unit committed to preventing mountain gorillas from disappearing. WWF’s David Greer hopes that someday the Gorilla Doctors’ presence won’t determine life or death for the species. “We need to find ways of creating an environment where we don’t have to rely on veterinary intervention for the continued survival of the mountain gorilla,” he says.